Excellent, thank you. I fixed it. The idea occurred to me while cleaning the house. A nice break from an otherwise persistent writer's block. 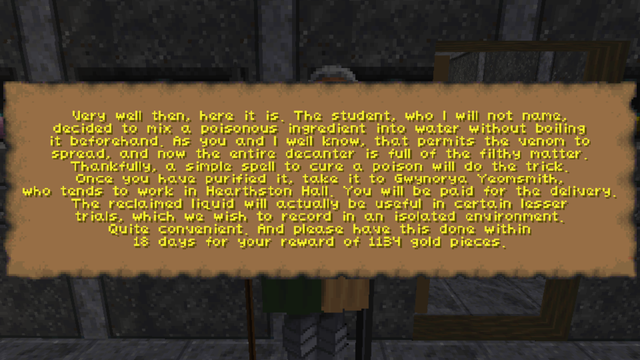 Mages Guild #16: "A Perilous Journey"
This is actually two quests in one. Once the "remove foe" action gets added, it'll add a third one. 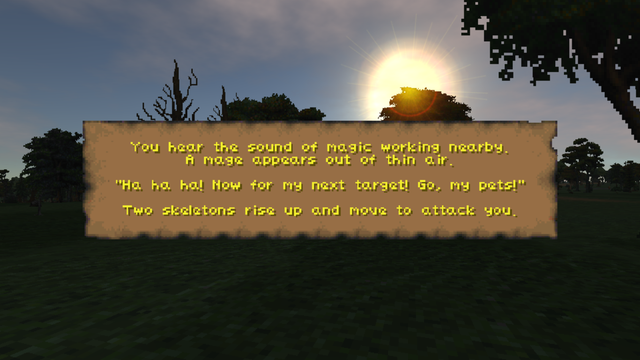 I've begun making quests using the "cast spell do task" action Interkarma added awhile ago. I have a few ideas to work from. I expect they'll belong mostly to the Mages Guild, since expecting a knight or fighter to cast spells is pretty incongruent. 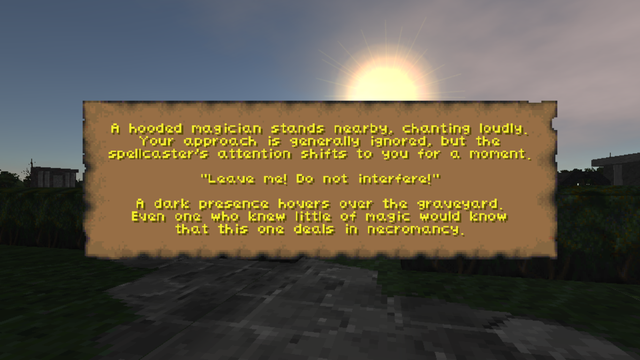 Perhaps some spells could make some quests easier rather than being necessary. Mages Guild #18: "Alchemic Mishap"
This one came to me while running errands today. 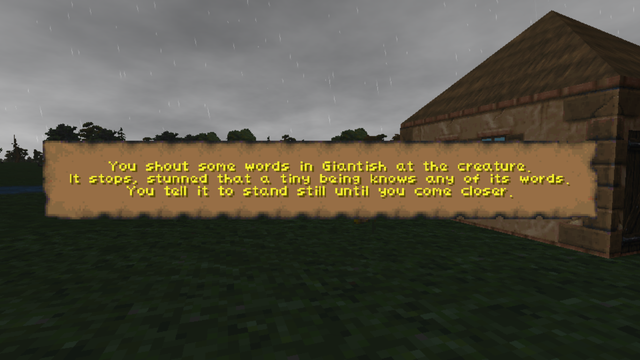 Moral of the story: stop trying to write quests and the ideas will arrive. #17 is on hold until the next build but it should work properly then. 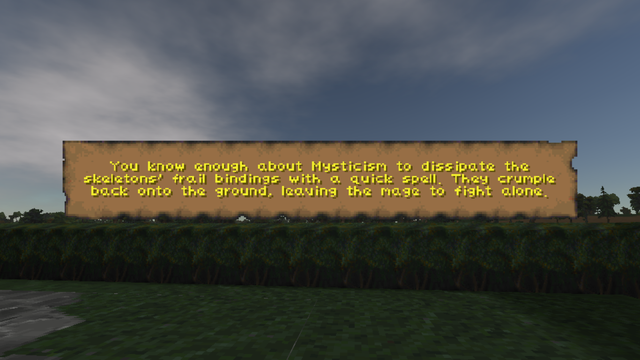 I've added about 10 new Perpetual Quests. Many of them use a delayed release function, similar to Warm Ashes. This opens up a lot of fun possibilities. Without Interkarma's special "pc enters ______" quest trigger none of these would be possible. Further, I reduced the cooldown for perpetual quests. Now they'll be coming much more frequently. How many have choices and different paths based on skills Jay? They're what I'm most excited for. 1. I've been making a lot of quests which have good cores but not much peripheral content. I haven't considered ways to add additional branches to them, since my writing style could be termed "flood of inspiration then long drought," and I want to get as many out as I can. 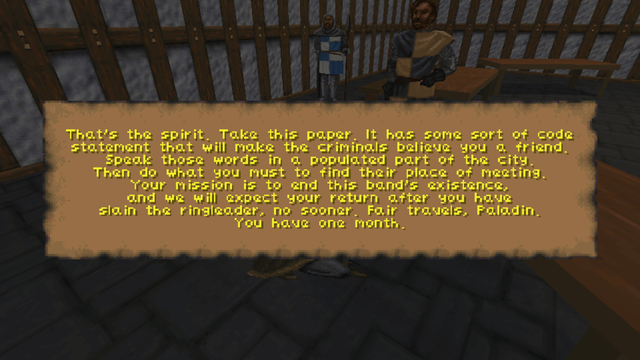 I've wanted to go back and patch old quests with more content, so I may do that. 2. Many of these quests are based around a core mechanic that doesn't share well with other mechanics. 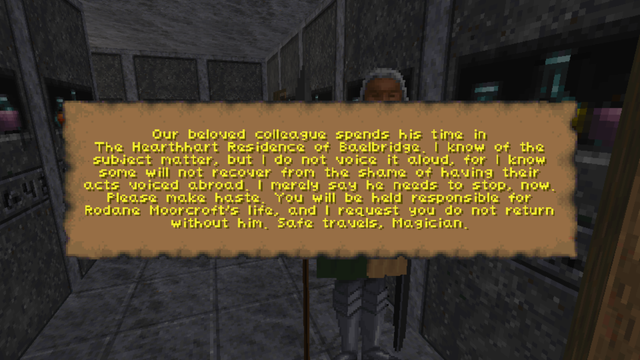 If I write a quest to stop a murderer in the streets, not many other mechanics fit well with it. (One just occurred to me, though; using Streetwise to gain a temporary benefit). 3. 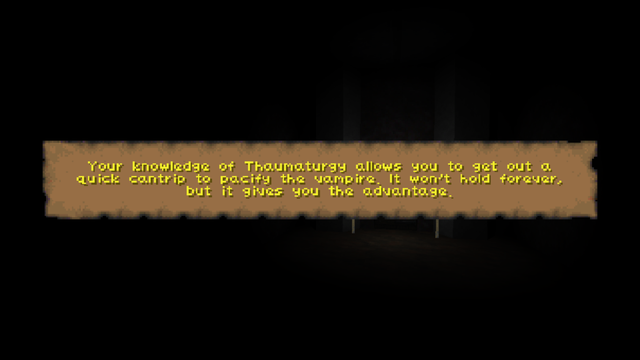 Not all quests have a benefit that the skill checks could offer. Many of these point directly at their solution, and there aren't many roadblocks that a skill check could help circumvent. It is possible, though. 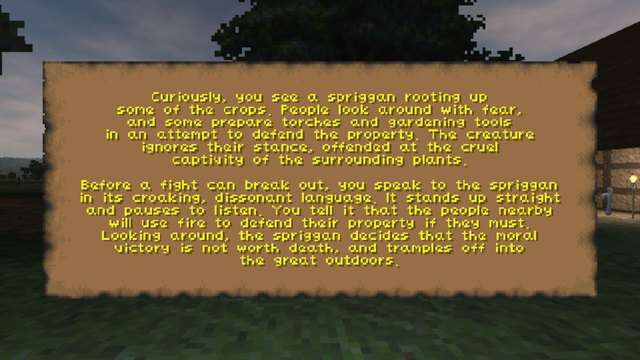 For example, one I recently created with a Spriggan could use its language skill, and likewise I could patch up an old one with orcs to add an Orcish skill check. 4. 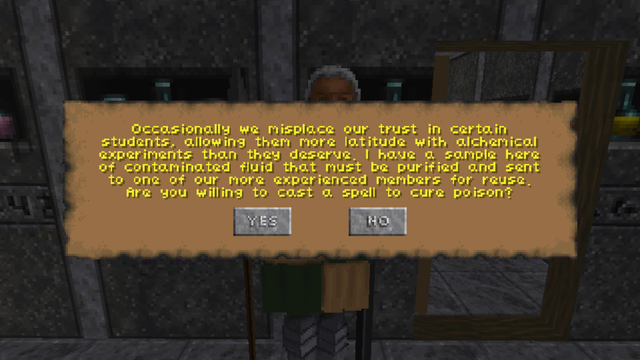 Here's possibly the biggest roadblock: at Daggerfall's decision points, the only prompt available is "yes/no." There isn't room for something like "yes/no/persuade," though a "persuade" branch could come after "no," and so on. That may be unintuitive, but it's the best shot we have. 1. Arrive on the property. Spriggan is attacking. 2. Choose to kill it or avoid the fight. 2a. Kill it for a reward. 2b. Avoid it for nothing. 2. Skill check obviates need for a fight. Get reward without fighting. 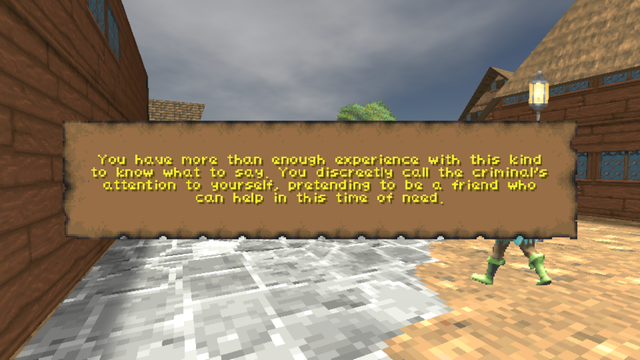 This sets up a situation where the decision is taken from the player, and the situation eventually becomes trite: there's no player freedom because the skill trigger will happen each time. As I write, though, I recognize there are other ways to handle this. 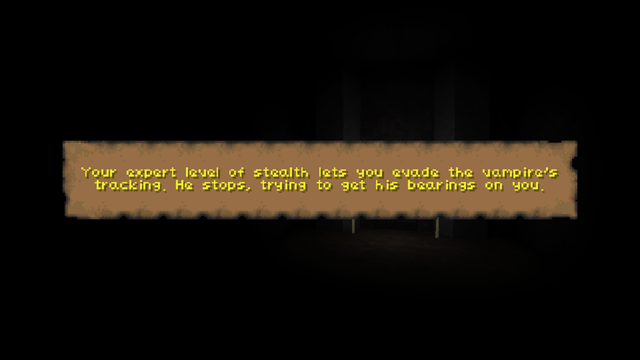 A new prompt for the skilled player could be something like, "Do you want to attempt to speak to the Spriggan? 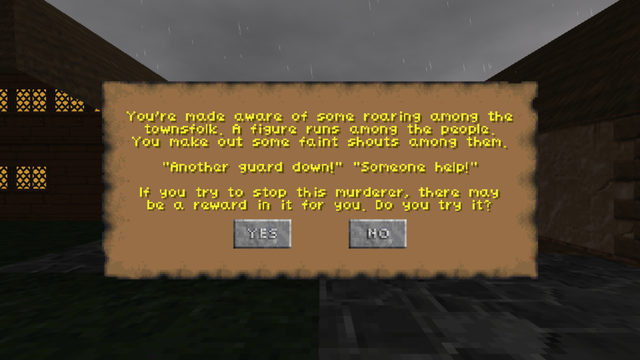 If not, you can help the villagers slay it." 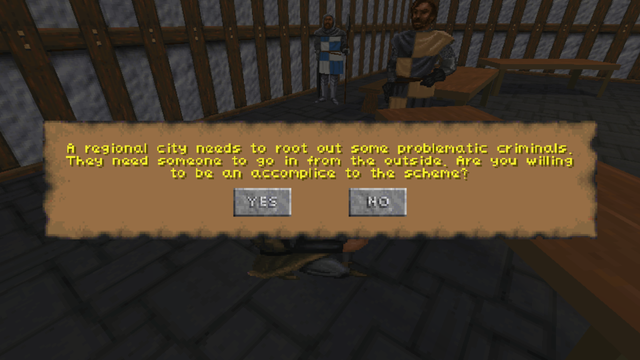 The ability to have a prompt consisting of more than 2 options would open this up more. The freedom is still limited but not as much as it could be. Summary: There are a few possibilities for it. I'll try to add in what I can that won't cut out a lot of gameplay. 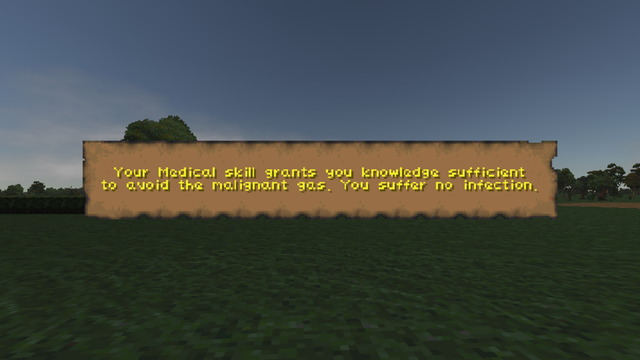 EDIT: I've added several skill checks with a bit of creativity. It won't be too hard. I just want to put them in meaningful places. EDIT 2: This is actually rather fun. I'm glad you made the suggestion. Here are some of the skill-based advantages that I added today. These work especially well with Perpetual Quests, since you can't keep choosing the same quest where you have the advantage. 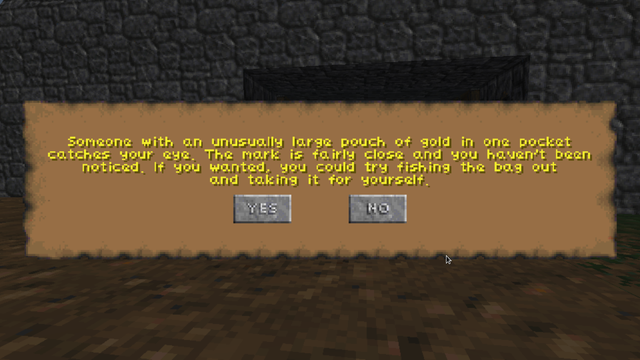 This Perpetual Quest is entirely skill-based, unlike a similar one I previously made about stealing from a wagon. I figured out how to rig it up so the skill floor could be one of three values. 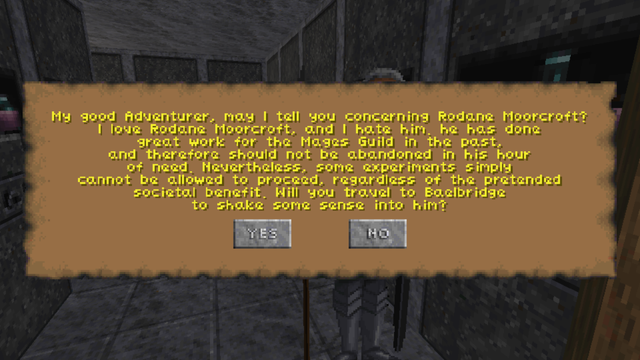 This was quite a brain boiler for me so I'm proud of it Now I'll be able to replicate the system in other quests.